Patrick Barkham switches on his torch and shines it at the dark. "There," he says, "do you see it?" He points the light straight in front of us, but all I can see is a circle of white and across it the random black scribbles of trees. Then, after a second or two, in the middle of the light, I spot it too: the eyes of an animal, bright red and fixed on us. For a second, I stare at it, and it stares at me. Then there's a little flash of movement and the animal disappears. Could it have been a badger? That's certainly what we came out to these woods to find, but today it would be easier to spot a celebrity than a badger. Just a couple of miles down the road, the Wigtown Book Festival has started and the area is full of writers and famous people, including Joanna Lumley. Finding a television star is not a problem. Finding a badger is going to be harder. Barkham, a nature writer who has just published a book on badgers, did warn me our hunt would be like this and there's a simple reason: badgers are exceptionally good at spotting us and we are exceptionally bad at spotting them. Even so, this wood is just the kind of place the species love. For a start, we are near a burn and they like water. We are also near some boggy fields which are nice and wet and easy to dig into for worms (the badger's number one favourite meal). The ground is also perfect for digging setts, their elaborate and elegant underground homes. Up ahead, Patrick Barkham is still looking at the spot where he sighted the pair of eyes. "I love the idea that a badger could be just a few feet away from us and quietly slinking off because that's how they do it," he says. "We could have a badger just a few feet away and he's looking at us and smelling us and we have no idea he's there." It is partly this, says Barkham - the ability of the badger to be close but inconspicuous - that has ensured its survival in the UK, although by any measure its survival has been hard fought. For hundreds of years, the species has been persecuted, baited, dug out and tortured and even now, 40 years after it was made a protected animal, the persecution continues. Across the UK, and particularly in the Central Belt of Scotland, baiting is a significant problem, while in the south of the England the persecution now has the sanction of the Government, an official justification (to protect cows against bovine tuberculosis) and a euphemistic name: cull. Even in Scotland, where there is no cull because there is currently no problem with bovine TB (which badgers have been blamed for transmitting to cattle) there is still great confusion about the badger and a stark division between lovers and haters. This is partly why Barkham wrote his book, Badgerlands. He wanted to explore this confusion and try to understand what the badger really is - predator or prey, harmless foraging animal or ruthless carnivore, good or evil? But he also wanted to explore the division the badger causes in humans and the fact it is caught in the middle of some classic divisions between upper class and working class, farmer and townie, men and women. The ordinary native badger, inconspicuous, harmless and happy in its 50-roomed home in the ground, has become a symbol of these divisions, and a victim of them. There is a war, and it is being waged through the badger. Take the divide between upper and working class for instance. Barkham believes the great misfortune of the badger in many ways was that it never became a formally hunted animal. "You can disagree with fox hunting," he says, "but it sets out a whole series of rules and a close season. But the aristocracy left the badger for the villagers to do whatever they wanted with, so you had this sport without any kind of rules and there was no taboo on it either, so people could just go ahead with impunity." In his book, Barkham vividly describes the consequences of this: baiting rings hidden in back rooms and courtyards where a brutal, bloody, rough and ready game was pursued throughout the 17th and 18th centuries. What he also describes is the curious modern version of it; how this nasty game migrated from country villages and farmworkers to mining towns in Ayrshire and council estates on the edge of big cities. It was, says Barkham, an affirmation of working-class community, a sport that labouring people kept to themselves and loved to practise in defiance of the ruling classes. "It's a weird, anachronistic subculture passed from father to son," says Barkham. And it is still happening. Ian Hutchison of Scottish Badgers, a charity that promotes knowledge and understanding of the species, tells me there is still a large amount of baiting going on in Scotland: around 120 incidents every year and around 12 prosecutions. "It's happening right across the Central Belt," he says. "The problem is that the chances of catching them in the act are very low." And it is men, not women, who are doing it - which leads us to the other dividing line that the badger lives on. There was one man - Kenneth Grahame, the writer of The Wind In The Willows and creator of Mr Badger - who did help change our perception of the badgers, but he was an exception. On the whole, it has been women, including Barkham's grandmother Jane Ratcliffe, who have changed our relationship with badgers, and they are still doing it: the protesters who are disrupting the current culls in Somerset and Gloucestershire are overwhelmingly women. Jane Ratcliffe first started working with badgers in the 1960s, when opposition to their slaughter was beginning to grow; she wrote articles, a book called Through The Badger Gate, she appeared on television and radio, and broke new ground by submitting a resolution on cruelty to badgers to the Women's Institute. As such, she was at the heart of the campaign which led to the Badgers Act 1973 which outlawed digging and baiting. Barkham's grandmother also had a personal relationship with badgers, adopting them and looking after them when they were injured. The first of them was named Bodger and when Bodger finally disappeared, possibly poisoned by bait laid for moles, Ratcliffe wrote movingly of her relationship with the animal. "Although I mourn her passing," she said, "one life has been made the richer and the fuller for her company." Barkham remembers visiting his grandmother and early encounters with her badgers. "She was a very exciting grandma," he says, "yet she wasn't a particularly warm or maternal person and she was one of these people who found the company of animals easier than humans. She was also pessimistic about the human race so she had a rather gloomy view of mankind and felt that animals are somehow almost more worthy of our care. She was passionate about them and felt they needed defending." What Barkham did not realise about her until he started researching his book was that she was just one of the influential group of women who campaigned for badgers - the group also included Eileen Soper, who illustrated the Famous Five books. "Suddenly all these women showed us a different way of engaging with the badger," says Barkham, "so that rather than treating it as sport, we could paint it, or watch it or photograph it." In the end, the women won their battle, although by the time the Badgers Act 1973 was passed, and digging and baiting were banned, the badger was facing a new problem: bovine TB. By the mid 1970s, the disputed link between badgers and TB was being made in the press, and by farmers, and the Government amended the Act to allow the killing of badgers under licence by gassing them. A cull in Gloucestershire appeared to show a dramatic drop in TB in cattle, although by the 1980s gassing had become controversial and was banned. It was not until the 1990s that the issue became live again as bovine TB began to significantly rise in parts of England and the badger again split the country into lovers and haters, into those who wanted another cull and those who wanted the badger protected and disputed the effectiveness of killing them as a means of controlling TB. Scotland, on the other hand, is officially TB free and both the Scottish Badgers organisation and the NFU Scotland tell me that they think that is because Scotland has more rigorous testing of cattle than England (cows are tested before they are moved and afterwards). In his book, Barkham looks at all the research and speaks to people on both sides, including Queen guitarist Brian May who leads the anti-cull movement, and the results are clear. Every mainstream scientist accepts badgers can transmit TB to cows but this does not mean a cull is the logical way to deal with it. Not only are culls fairly ineffective but, as Barkham points out, the science is not the main driving force anyway. "The cull is a sop to the people in the countryside who would like the hunting with dogs act repealed," says Barkham. "However, David Cameron and the Tories on the back benches know that they can't get that through Parliament - they haven't got the numbers - but they can at least show they are on the side of the country person. It's symbolic politics. They're allowing farmers a little bit of autonomy again. They're saying: 'You go and sort out the problem with badgers, we're not a bunch of townies.'" And there is another important point - perhaps the most important in Barkham's book. Yes, he says, badgers can pass on TB to cows. Yes, a cull may reduce the disease in cattle. But even if you accept all of that, there is a critical question for farmers and the rest of us: do we want to farm in a way that is dependent on killing one of our native animals? Barkham's answer is no and that's because he has spent so much time close up to badgers and has fallen in love with them. His book is full of loving descriptions of how they look - what he calls their mint-humbug faces, the dark grey fur, bouncy and luxuriant, and the curious, dainty tail that is an amusing anti-climax to their long bodies. It is also full of wonderful detail about how they live in their setts. In Dumfries and Galloway alone - where we are today - there are around 3000 setts and they are fascinating places. A typical sett will feature 16 entrances and 57 chambers, and the badgers, usually between five to 10 in a social group, will have excavated up to 25 tonnes of soil to create it. Inside, the badgers usually move between different bedrooms and spend around three nights in each one (possibly because it helps control parasites). One other curious behaviour pattern is that badgers will bury their dead in one chamber and then seal it up. Why they do that? Is it some kind of funeral? Is it to control infection? 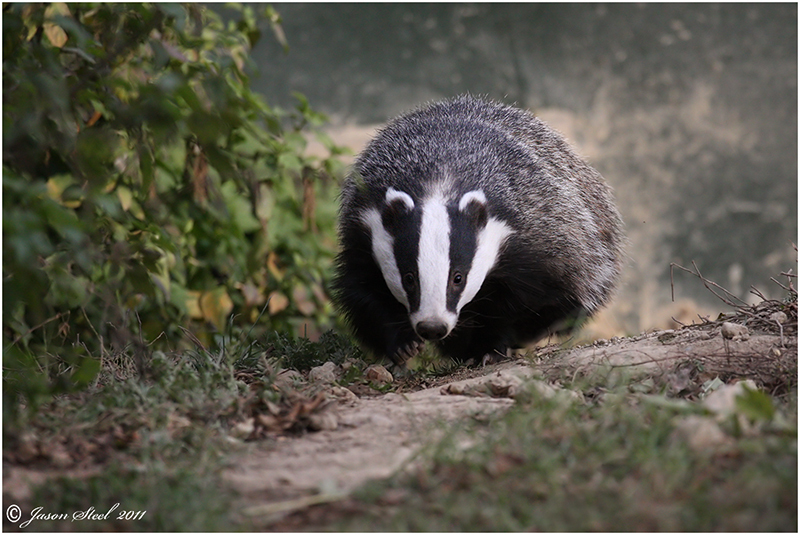 Which leads to the beginning and the end of Barkham's book: the fact there is a lot we still do not know about the badger and there is always that constant confusion that draws some people to badgers and repels others. With a cull going on right now in England, you could get depressed about that, but Barkham is upbeat. We may not know what the badger really is, we may be killing a species that is supposedly protected, but the population is rising and it is enduring, charming, independent and beautiful. Footnote from Norma Kearton - This wonderful book is totally absorbing, informative, factual (sometimes distressing) and certainly reinforces my own determination to save our badgers for future generations. 'Badgerlands' by Patrick Barkham is published by Granta. A new, updated paperback was published in 2014; both versions are still available. If you wish to purchase 'Badgerlands' from Amazon (at the time of writing their paperback price is £9.98; Amazon prices can change up or down overnight) you can raise a donation for B-R-A-V-E from the Company. Click on the banner below and register with easyfundraising for free (if you haven't already done so); check that B-R-A-V-E is your chosen cause and then, still from the easyfundraising site, click through to Amazon and purchase as normal. The tracking from easyfundraising will 'ask' Amazon for their donation to help B-R-A-V-E.